That Barbados had Muslims on its shores before the arrival of the Europeans is perhaps a reality that hasn’t been proven by physical evidence. Nevertheless, many noted historians have argued that there was an African presence in the Caribbean long before Christopher Columbus. Dr. Abdullah Hakim Quick, in his book Deeper Roots presents the case that Muslims from the African continent were visiting this region for centuries before Columbus. His research has shown that African Muslims were engaged in regular contact with the Amerindian people of this region and many married and settled in the Americas. Although Barbados was uninhabited when the English arrived here in 1627, historical evidence has shown that Barbados did have a presence of Amerindians, Arawaks and Caribs. The Portuguese who visited the island before the English called it Os Barbados – The Bearded Ones. Dr. Richard Allsopp, a Caribbean linguist argues that this Portuguese word actually refers to bearded people and not trees as previously thought. His research indicates that the Portuguese when they visited the island probably found bearded people living here. Amerindians are not known to carry much facial hair and so these people were probably a mix race of Amerindian and African. Muslim, a strong possibility. The next possibility of a Muslim presence on the island was from the slave trade. It is a known fact that many of the Africans taken as slaves from West Africa were Muslim. Many tried to keep their identity but that was illegal and it became lost in the generations that followed. There are some reports by missionaries that some of the slaves they encountered on the island spoke Arabic and practiced Islamic customs. Research has shown that the first known Muslim to arrive in Barbados was over ninety years ago when in 1913 Abdul Rohul Amin, a silk merchant from West Bengal came to Barbados. Soon after, some more Bengalis arrived and they shared a house in Wellington Street, in the City. Some of them also lived in Milk Market and Tudor Street (upstairs Bata Shoe Shop) in Bridgetown. Most of these Bengalis married local Barbadian women and started families in Bridgetown. Today many well-known Barbadians are the grandchildren of these unions. These Muslims started the itinerant trading process, which continues up to this day. In the early stages most of the trading was with poor Barbadians living in the country areas who found it difficult to get to Bridgetown to do their shopping. The traders would take the bus to get their wares to the people in the country. If there were no buses available they would walk long distances just to accommodate the customers. In those days many Barbadians could not afford to pay cash for goods, so credit from the “Coolie man” was a welcomed commodity. Over the years, these traders built up a relationship with Barbadians, which still remains of mutual benefit. Following the Bengalis, Muslims from villages in Gujarat, West India arrived. It is reported that the first of the Gujarati Muslims came in 1929. These Muslims had set out for Brazil to cut timber but ended up in Guyana and stayed there for a while. In Guyana they learnt that there was money in coal trading with Barbados. They visited Bridgetown a couple of times by boat and then decided to make Barbados their home. Many of them settled in Tudor Street, in Milk Market in the early days. Following their settling in Bridgetown more Gujarati Muslims came and took up residence in various parts of the city and its environs. They also got involved in the itinerant trading business and was very successful allowing them to buy houses in the city. Some of them also ventured into setting up stores in Swan Street and Tudor Street. The first Muslim place of worship, Mosque (picture on the left), was built at Kensington New Road, Bridgetown, in 1950. The second was built in Sobers Lane in 1957. At present there are close to 2000 Muslims living on the island, many of whom still reside in Bridgetown in their own properties. The Mosque at Kensington New Road was expanded in the late 80’s and can accommodate over 600 worshippers. Prayers are held there and in Sobers Lane five times a day, with special congregational prayers on Fridays just after midday. Two other Mosques on the island that also cater to the needs of Muslims have their history in Bridgetown. The Islamic Teaching Centre was started in the 70’s in the city and now has a permanent home at Harts Gap, Hastings. This Centre was set up to cater to the needs of the wider Barbadian community who were interested in Islam. From the late sixties and early seventies a number of Afro-Barbadians have become Muslims. This trend continues until today with many persons expressing an interest in Islam and some actually entering the fold. Several activities are carried out to inform the wider society about Islam. These activities include articles in the press, news and features on the radio and television, public lectures and lectures in schools and other educational institutions. While the mosque at Belleville (pictured below) was established by those Muslim families who chose to move out of Bridgetown in the 90’s and live in Belleville and surrounding areas. Muslims from the neighboring countries of Trinidad and Guyana who migrated here have also settled in Bridgetown and formed part of the community. Today the children, grandchildren and great grandchildren of the first Muslims in Bridgetown are involved in all segments of society and make significant contributions to the development of Bridgetown and Barbados as a whole. Some are doctors, lawyers, engineers and public servants. The Barbados Muslim Association (B.M.A) is a body formed in 1997 to represent all the Muslim Mosques on the island of Barbados. There are approximately 2000 Muslims living in Barbados. There are five places of congregational prayers. Each Masjid has its own administrative committee and is independently registered. 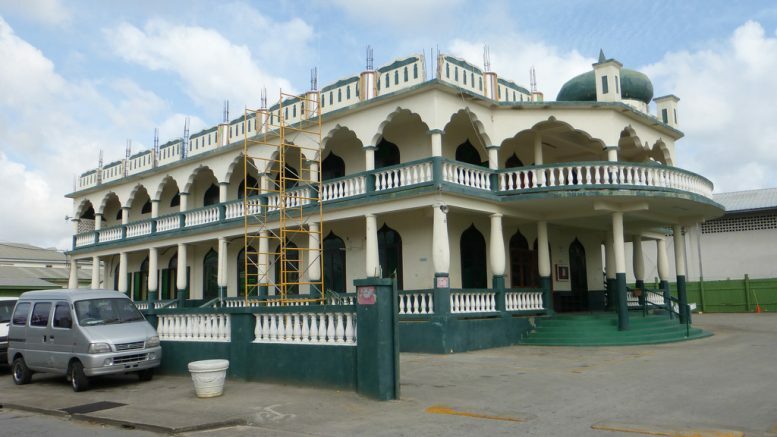 A representative of each Masjid sits on the Board of the Barbados Muslim Association. In addition five (5) Muslims are selected to the Board at Annual General Meetings at which the entire Muslim community is invited to take part. The Board of the B.M.A is made up of a total of ten (10) persons. These brothers then elect a Chairman, Secretary, Treasurer, Assistant Secretary/Treasurer and Public Relations Officer. The B.M.A was formed to represent the Muslim Community of Barbados at various levels and to service the collective needs of the Muslim Community. Over the years the B.M.A have made representation to the Government of Barbados on a number of issues relating to Muslims. These issues include the wearing of Hijab by Muslim women. The B.M.A has also organized and facilitated donations to various charities on the island. The B.M.A , as a representative body of Muslims has been invited by Government to various functions. At past Independence celebrations we were invited to say a prayer. There are a number of projects which the B.M.A is currently pursuing and we hope Insha-Allah to achieve in the future. These include a Zakat Fund for the Muslim community, to collect Zakaah and other money for charity. Be the first to comment on "Overview of Barbados Muslims"